I may have failed to obtain the gold certificate for my Marmotte in Austria (report), a mission impossible anyway had I known the correct required time beforehand, but I was not discouraged. I managed to complete the course, which no matter what was 170+ kilometers through mountainous terrain. No real high mountains, with summits only around 1,500 meters, but the climbs were often tough and not any less than most of the ones you find in the ‘classic’ Marmotte in the Alps (info). Nevertheless, it was rated a lot easier than that one, given the times required for a gold certificate. So, while the distance was not really a problem, I’m set on finding out whether or not the climbs are actually that much tougher there. Obviously, the altitude is a factor to keep in mind. The Galibier has its summit at 2,645 meters, which is a good kilometer higher than the finish at the Arthurhaus in Austria. The thin air, specifically above 2,000 meters, is an additional challenge. But while there is a bigger overall elevation difference to overcome in the Marmotte Alps and the climbs are (almost) all longer than in Austria, the grades are actually not any worse. So, I’m planning on finding out if the time difference of 2:40 is justified or not – this time, at least I’m certain that my ‘target time’ is 9 hours*. I finished the Marmotte Hochkönig in a ‘net time’ of 8:16, including breaks. I don’t think I could have done that a lot faster, even if I was fixed on a wrong schedule – I would have minimized the breaks or even cancelled them altogether, as Paula could have supplied me ‘on the fly’. On the other hand, given my physical problems / limitations, I know that with or without breaks, in this type of terrain, I will be struggling after the 120 kilometer mark (if I’m lucky) anyway. What’s more, I’m also planning on riding the Gran Fondo Sestriere, which was a Look Marmotte – ‘la Marmotta’ – event in 2015. This event, officially scheduled for July 23 this year but cancelled last minute, is arguably ‘easier’, as it’s less than 120 kilometers long, with 3,200 meters of elevation difference. 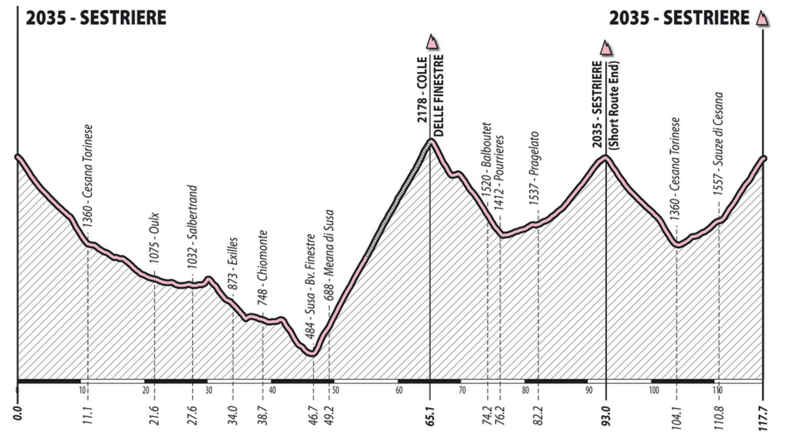 However, it features the climb up the infamous Colle delle Finestre and a double loop up to Sestriere. The Finestre (Window) has featured in the Giro a couple of times. It is some 17 kilometers long, averaging 9.1% – there are not too many steeper bits exceeding that, but either side of 9% is challenging enough as it is. It features a 3 kilometer stretch with no less than 28 hairpins and the final 7+ kilometers are gravel, making it even harder to climb. So, there you have it: Marmotte or bust – more on the rest of my Tour de France 2017 shortly! * I will not get a gold certificate for ‘my’ Marmotte even if I do finish within 9 hours – you only get that when you participate in the official event. I’ve just come back from two weeks cycling touring (camping) in Corsica roughly following the Raid Corsica route although we did miss out the bottom drag around the south of the island to Bonifacio as it was all on main roads and I must admit Corsican drivers are not the best ‘cycle friendly’ ones! Have you been to Corsica? If so love to know your views. I’m planning to attempt the three ascents (Les Cingles) of Ventoux in September – have you done it? If so any advice much appreciated although, of course, there’s loads of it on the internet. Anyway keep writing which of course means keep cycling. Yes, I did do the Cinglé (https://www.bikerebel.com/2014/06/tour-de-france-2014-stage-6/), but I might not be the best person to ask for advice. I cycled half a Marmotte the day before (Croix de Fer & Télégraphe/Galibier), after which the transfer to Bédoin took us some 4 hours. As we arrived late, I therefor started my first climb rather late (10:00) the next morning and by then it was already quite hot. I had a blistering hot second ascend from Malaucène and in hindsight, this should have been my first under those conditions. This ascend is more open with way less tree cover and the steep bit between km markers 11 to 8 was very demanding. Clearly, the main thing to keep an eye on is the weather and if it’s going to be hot, start at dawn. Also look at the wind forecast and be careful when descending because as much as the wind might be annoying when ascending, it can be a menace going down.